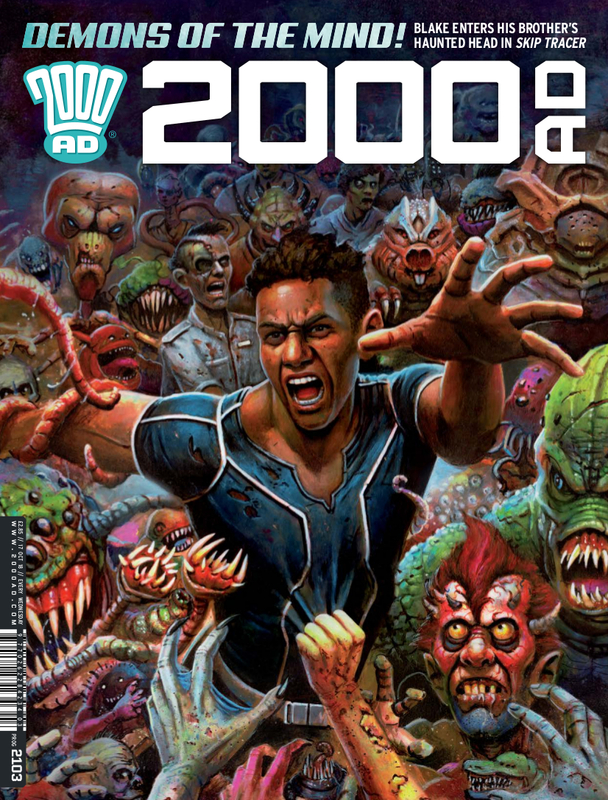 Prog 2103 includes several tributes to artist Carlos Ezquerra, who died on 1st October at the age of 70. It’s hard to overstate his influence on 2000AD. Carlos was responsible for the look of Dredd and his world, for Strontium Dog and its western ethos, and a whole bunch of other stories. Even after forty years, he was still producing iconic art on a regular basis. He was also, by all accounts, a lovely man. The world of 2000AD, and comics in general, is poorer without him. There’s a perfect pace to Judge Dredd: The Small House. In this prog, Judge Dredd and the The Justice Gang welcome Dirty Frank back to the city, with his kidnapped black-ops soldier and “Totally Ordinary Foreign Visitor” friend. Elsewhere, a single panel close-up of Chief Judge Hershey is flooded with meaning, and Dirty Frank shifts from quick-witted dialogue to his rare and dark moments of clarity. Jumping between high drama, political thriller and comedy, The Small House also sees Dredd’s funniest outburst in a while. It’s a story full of tiny, telling moments. It's smart, and expects the reader to connect the dots. Kurtis finds a listening device and witnesses an extreme reaction in Brink: High Society. Despite the outburst of violence in this episode, Brink is never a high octane thrill. It will likely have lost readers along the way with its wordy, whispered conversations and hidden motives. High Society, however, is a quite brilliant continuation of the Brink story. Brink is about very real people living in very unreal conditions. Reactions to violence in Brink are the most honest you’ll see in any comic, and in most fiction. INJ Culbard’s art is ostensibly simple, but filled with meaning: The shift in lighting and colour between scenes, or how a sudden and shocking outburst breaks all the rules are masterful. Brink wonderfully conveys stillness and order. Schmitt is forced to rely on the vampire Constanta, following him on his quest to find the Baba Yaga in Fiends Of The Eastern Front: 1812. As the pair trek through the frozen wastes, Constanta provides a brief history of his vampirism, and Schmitt becomes convinced that life can't get any worse. Fiends of the Eastern Front is another classic story that Carlos Ezquerra was responsible for, with his lean and animalistic vampires constantly on the verge of suddenly delving at the nearest neck. Dave Taylor is a worthy successor. 1812 has taken the “vampires at war” basics of Fiends and added extra levels of supernatural. The Baba Yaga – a Slavic witch who rides around in a giant mortar & pestle and lives in a house atop a single giant chicken leg – might be a magical step too far, but so far this is a creepy and compelling ride. ...everything that happens is predictable. In this prog, Nolan journeys into his comatose brother’s mindscape, to do battle with the memory of an abusive father. It’s all very confusing to Nolan, who presumably hasn’t watched much sci-fi, otherwise he would know the rules. I keep waiting for Skip Tracer to break free and do something totally unexpected.